In emerging market countries where economic volatility is a way of life, there aren’t a lot of relatively safe options for members of the burgeoning middle class to park their money. For instance, countries like Nigeria have experienced a tremendous growth in the number of citizens entering the middle class, which now accounts for about 23 percent of the population (it’s around 50 percent in the U.S.), according to a recent article citing the African Development Bank. While Nigeria now faces some significant headwinds from a weak domestic currency (the naira), high interest rates and a manufacturing recession, there are ways that local investment can both protect the wealth that’s been created and encourage investment domestically to potentially spur development. At least, that’s the conclusion that college friends Razaq Ahmed and Edward Popoola came to while they were thinking about opportunities for new financial services options in their home country of Nigeria. The two men, Ahmed with a background in finance and Popoola in computer science, are launching a company called CowryWise that gives Nigerian investors a way to save their money by investing in high-yield government bonds. The rates on those products are high enough to absorb the wild swings in value of the naira and still provide a healthy return for investors, according to Ahmed. Set to present at this year’s demo day from Y Combinator, CowryWise is one of a number of startups that Y Combinator has backed coming from the African continent, and an example of the wellspring of entrepreneurial talent that is flourishing in sub-Saharan Africa. Using CowryWise, a customer would just have to sign up with their email address and phone number and link their bank account up to the CowryWise platform. There are already roughly 57 million savings accounts in Nigeria and 32 million unique bank users. By investing in the bonds, these savers gain access to interest rates that range between 10 percent and 17 percent, according to Ahmed. “The bonds… are similar to the treasuries issued by the U.S. government, which is A-rated,” says Ahmed. Even if there were foreign currency risk from investing in the naira, the inflation rate is currently around 11 percent, according to Ahmed. Given that most of the bonds are yielding interest rates on the higher end, it’s just a better deal for consumers, he said. “There’s more value in keeping the money in government treasury bills” than in the bank, says Ahmed. 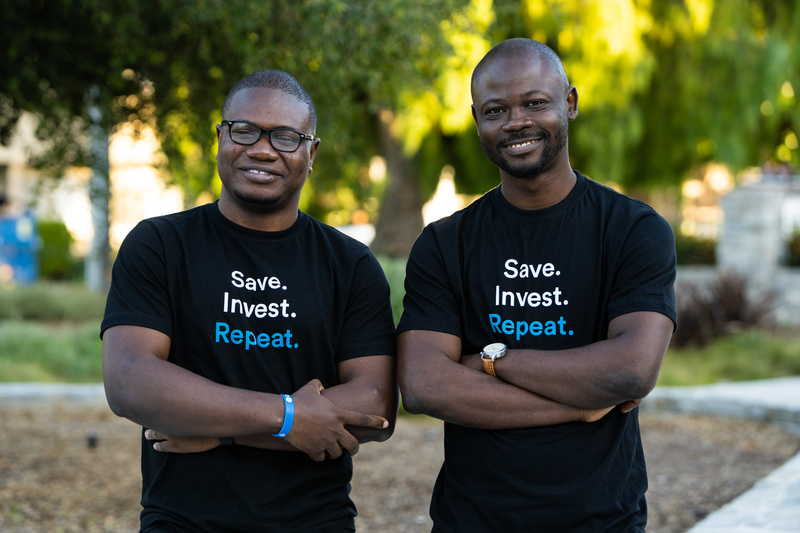 For Ahmed and Popoola, the decision to launch CowryWise was a way to bring investment opportunities to a retail investor that hadn’t been able to access the best that the financial system in Nigeria had to offer. To target these retail investors meant leveraging technology to scale quickly and cheaply across the country. The two men started developing their service in January and tested it in February and March with friends and family. CowryWise isn’t without competitors. Another Nigerian company, Piggybank, recently raised $1.1 million for its own automated savings solution. Like CowryWise, Piggybank also taps into government bonds to offer better rates to its investors. That company already has 53,000 registered users — who have saved in excess of $5 million since 2016, according to a release. There are subtle differences between the two. Piggybank touts its ability to save through bonds, but it is primarily working with banks to get Nigerians saving money. CowryWise is using Meristem Financial (Ahmed’s old employer) as the asset manager for its investments into the bond market. Another difference is the time customers’ funds are locked up. Piggybank has a three-month savings period required before investors can withdraw funds, while CowryWise will let its customers withdraw cash immediately, according to this teardown of the two services. Ultimately, there’s a large enough market for multiple players, and a need for better financial services, according to Ahmed.